The origins of the cheery name are ambiguous, but The Optimist could refer to the rosy outlook of co-founders Christian Talpo and Manuel Palacio in deciding to open yet another Spanish-themed nightspot in a city (and neighbourhood) where’s there’s a virtual Mediterranean epidemic. Then again, this is the team behind vibrant venues like homestyle Italian eatery Pirata. 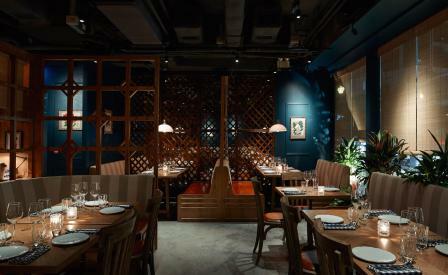 And with executive chef Alfredo Rodriquez, a 15-year veteran of top Madrid restaurants such as Lobby Market at the helm, The Optimist should be off to a flying start. Up and coming Spanish designer Rocio Martinez has wisely opted to dial down the sunny vibes throughout the three-story space in favour of sophistication. The street-level bar is bright and breezy, layered with hanging plants, touches of sea-green tile and latticework that suggest rather than shout about The Optimist’s Southern European connection, while in the upstairs dining areas darker shades, metallic lighting fixtures and wood dividers foster a more formal yet intimate atmosphere. When it comes to the cuisine, The Optimist is true to its motto: ‘We Grill Things’. Patrons select from a range of European-sourced seafood and choice cuts of meat that are cooked asador-style over hot coals and served with sides like grilled vegetables and eggplant fries. The owners warn diners not to expect tapas or paella, and to prepare to leave full -- at least two ways in which The Optimist is likely to distinguish itself from much of the direct competition.